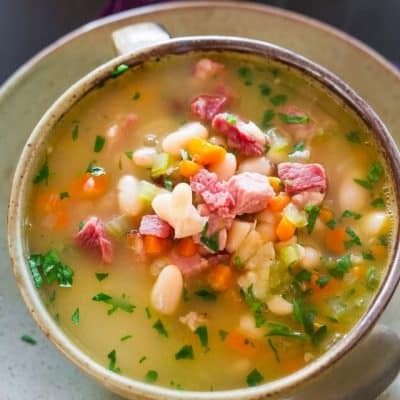 Leftover Ham and Bean Soup – perfect use of that leftover ham from Thanksgiving or Christmas dinner. This soup is delicious, hearty and smells heavenly. If you’re making ham for Thanksgiving or Christmas, you will likely have lots of leftovers, like I did. So what’s a girl to do with all that ham? 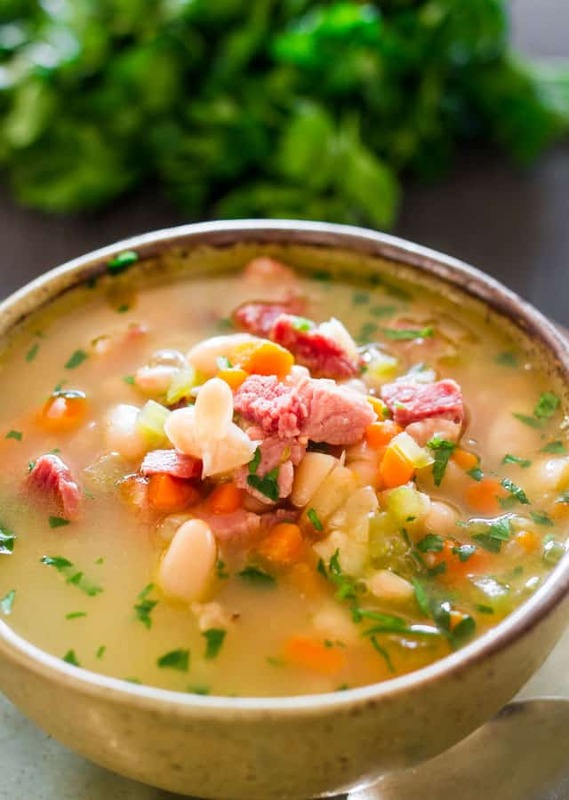 As I was pondering what to make with all that ham, I remembered my mom’s ham and bean soup. So good and such a comforting dish. And that’s what I did. We still have lots of leftover ham, but this put a bit of a dent in it. Although you may think the list of ingredients may seem a bit long, trust me, it’s so easy to make. I can’t tell you how yummy this soup is, so comforting, so hearty and so filling. This may seem a bit strange to some of you, but we usually eat this with raw red onion and salt. You take a small piece of onion, dip it in salt and have at it with the soup. May sound strange, but boy does it give this soup a new flavor dimension. Totally yummy. Yes! You can purchase a prepackaged ham from your local grocery store and use that instead of leftover ham. 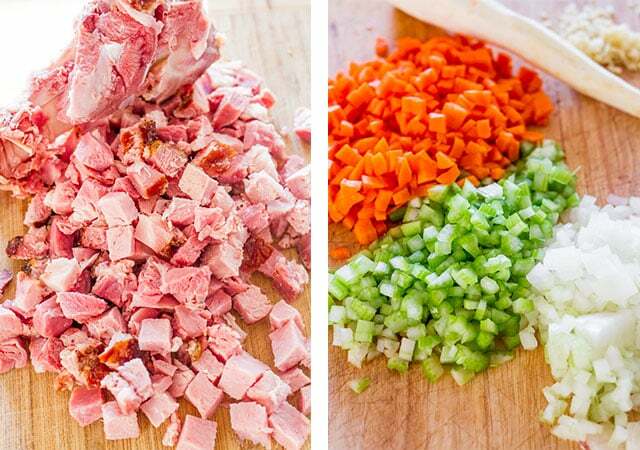 If you don’t have a ham bone, just skip it, it’s used to flavor the soup. 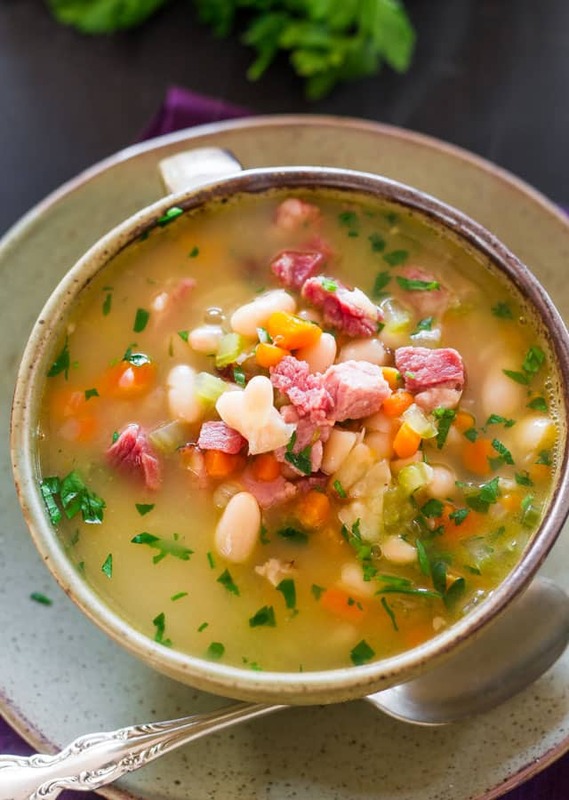 Leftover Ham and Bean Soup - perfect use of that leftover ham from Thanksgiving or Christmas dinner. This soup is delicious, hearty and smells heavenly. In a large soup pot, heat olive oil. Add onion, celery and carrot and cook for about 5 minutes until onion is tender. Add garlic, ham, ham bone, parsnip, bay leaves and the broth. If you don't have a ham bone, just skip it. Bring to a boil and lower heat to medium. Let cook for about 30 minutes. Add rinsed beans, cumin, thyme and season with salt and pepper. Continue cooking for another 30 minutes. Remove ham bone, bay leaves and parsnip. Garnish with parsley and serve. Can I chop up the parsnip: Yes, of course. I use a whole parsnip to simply flavor the soup, but I know some people prefer to actually eat, so in that case, chop it first, then add it to the soup. Can I use dry beans instead of canned beans: Absolutely, just keep in mind that dry beans take longer to cook. You'll need about 1 cup of dry beans for this recipe. Also if using dry beans, you can soak them in water overnight if you choose. Usually this is done to speed up the cooking process, however studies have shown that it will only cut about 10 minutes of cooking time. How do I store leftovers: Store leftover soup in a covered glass or plastic container in the fridge for 3 to 4 days. Can I freeze this soup: Yes you can. While the soup will only last 3 to 4 days in the fridge, it can last up to a month in the freezer. Make sure the soup is cooled completely first. Use freezer bags for this such as gallon or quart-size top plastic freezer bags. Ladle soup into each bag then let out any excess air and seal. Lay bags flat in a single layer in the freezer. Once they're frozen you can stack them to save space. To reheat, thaw them overnight in your fridge then pour them in a saucepan and reheat over low heat. You can also reheat them in the microwave. Will be making this soon! Soup is a favorite of ours, along with some good crusty bread. Also, if you do not have a ham bone, use a ham/pork hock. These can be found at most grocery stores and has the smokiness of ham. How large of a pot do you need and how many does it feed? Should I double it for a family of 4 big eaters? This recipe will make 8 servings so it will definitely be enough for 4 big eaters. Use a large soup pot at least 6 or 8 quart. Hi- have you tried in a crockpot? Thank you. I just made this, definitely a keeper! I don’t often measure ingredients, so I used more of everything except the broth, made for a nice chunky soup. I also sprinkled shredded parmesan cheese on top of each serving, everyone liked it. I liked your recipe. It got me started, since I was pondering what to put in my soup. Made a batch loosely following it, but I didn’t have several of the ingredients, so I omitted them or substituted others. Examples: didn’t have most of the vegetables called for, so I substituted a generous amount of frozen mixed vegetables; substituted a variety of dried beans & lentils for the canned beans; MISREAD the “cloves of garlic” ingredient! I tossed in some ground cloves. Oops to late! I think it added a nice flavor, though, when all was said and done. (Also put in some garlic after discovering my mistake.) Added 2 cups of quartered miniature potatoes; added 2 sweet potatoes cubed into 1/2 to 3/4″ squares; didn’t have much leftover ham, but did have some leftover turkey kielbasa, so threw that in instead; added a generous dash of cayenne powder for good measure. Why rate and review a recipe you didn’t follow in the slightest bit. Great, that your soup turned out well, but it is completely unhelpful to anyone actually wanting to make and follow the recipe. I understand your point, but it’s possibly helpful to someone who wants to make leftover ham soup and just needs some general guidance. This recipe got me started. That was my reason for writing. Anyone is free to follow the original, and my comments don’t detract from the author’s excellent recipe but folks shouldn’t be afraid to wander from the path a little. Otherwise, there would never be any innovation. Love the recipe and appreciate you sharing it but one comment: using un-soaked dry beans does not add 10 minutes. It added at least two hours and the beans were still too dense while all the ham and veg was completely mush. That said, it was still good! Thanks for the reply and clarification!